Rollators are mobility aids frequently used by those who are suffering from a degenerative disease like arthritis or some form of fibromyalgia. Traditional walkers and canes require the person using them to exert themselves when moving about, requiring energy and coordination that they may not have. Rollators are easier to use than a standard walker, with accessories and customization options allowing a rollator to be a useful and unobtrusive tool. Aluminum rollators get their strength and longevity from the metals used in their construction. Even though many rollators can look like they were made with the same piece of metal, they’re constructed from either steel or aluminum, two very different materials. Aluminum has shown itself to be a superior metal when it comes to the strength and durability of a rollator. Aluminum has unique physical properties, including a low-density infrastructure that allows it to be lightweight yet have a high fatigue limit. Its superior malleability and manufacturing, as well as its ability to resist erosion, has spotlighted aluminum as a preferred metal for rollators. The low density translates to a rollator that is very lightweight, without sacrificing strength. When compared to the malleability of steel, aluminum is more elastic. Its flexibility is not a cause of concern – the low density of aluminum has a larger threshold for dimensional limits, absorbing the impact of different types of terrain as you roll the rollator on rough surfaces. One of the best attributes of an aluminum rollator, is that it has superior corrosion resistance – it is particularly difficult for aluminum to rust. Rust resistance means that you could use your rollator in situations that might’ve ruined other mobility tools. There are several aluminum rollators on the market, with different designs that cater to almost every sort of disability. These rollators are not only top-of-the-line, but they are substantiated by reviews and a following due to their durability, maneuverability, and giving back confidence to those who want a reliable mobility aid. Combining attractive aesthetics and functionality, the Drive Medical Nitro Rollator uses an aluminum frame for stability, with brake handles conveniently placed on the ergonomic hand grips. Not only is this a solidly built rollator, but it comes with all the features and customization options that you expect from Drive Medical – this includes a removable bag, large wheels, and an easy to fold design that allows it to convert into a compact size for storage. Its front wheels are 10 inches tall, for optimal steering. Larger wheels enable the rollator to operate on rough surfaces with ease, allowing you to take your Drive Medical Nitro Rollator in parks that may have patches of dirt or grass. Since it is made with aluminum, the Drive Medical Nitro Rollator will further absorb impact on rough surfaces. The brake cables of the Drive Medical Nitro Rollator are hidden inside of the chassis so that it won’t take away fro5 m its appearance. The handles are joined with a back-support harness, allowing you to take a seat whenever you need it and trusting that your Drive Medical Nitro Rollator will support your weight and the occasional lean. This compact yet accommodating Rollator can support up to 300 pounds, highlighting the benefits of aluminum. Made in the U.S, the Zoom series Nova Medical Rollator is designed for those who are always on the go, with its small footprint making it even a mainstay for indoor usage. Nova Medical Rollator comes in different seat heights, designed for people of all sizes between 4’10” and 6’2″. One of the overlooked features is the practicality of the hand brakes. You want hand brakes that allow you to use them in a pinch, as well as give you the option to lock them into place. A locking mechanism installed with the hand brakes lets you sit on your Nova Medical Rollator with the peace of mind knowing that it will stay secure and in place. Metallic paint finish on the aluminum legs gives the Nova Medical Rollator a luxurious look. NOVA Medical stands behind their product, with a lifetime limited warranty for the aluminum frame and a five-year warranty for the brakes. The Medline Heavy Duty Bariatric Rollator takes full advantage of the fatigue limit of aluminum, with this mobility device catering specifically to those who are bariatric, which are patients that have a BMI of 30 or greater. This bariatric rollator has a much higher weight limit than other devices in its price range, with the rollator supporting up to 400 pounds of weight. Not only is aluminum used in this rollator to ensure strength, but it has a wider distance between its handles for extra room, with a padded seat. Like many rollators, this one has large eight-inch wheels. Catering to those who may have bariatric issues, the wheels are designed with reinforced spokes. Although a bit bigger than a standard rollator, at 19 pounds, it is a heavy-duty mobility device, made to support larger users. Velcro straps secure the removable pocket. It’s important to note that the Medline Heavy Duty Bariatric Rollator is 29 inches wide, and may not be suitable for indoor usage as it may have a difficult time fitting through door frames. Secure brakes allow you to push down to lock it and then pull up to release them. The Hugo Mobility Rollator does all the essentials right, with built-in seats with a supportive backrest providing a perfect place to sit down and relax. Instead of the mesh style or open basket design for its storage, the Hugo Mobility Rollator uses a conveniently placed, closed pouch for more privacy when traveling. Hugo Mobility Rollator has a height adjustable handlebar for proper positioning for your height and posture. Many rollators have handlebars that are difficult to manage; thankfully, this rollator has ergonomically sound hand grips that won’t cause additional strain on the wrists. This 15.4 lbs. rollator can accommodate a weight capacity of up to 300 pounds. Brakes are easy to use, making the Hugo Mobility Rollator ideal for those who are suffering from arthritis. Large eight-inch wheels give you mobility, without sacrificing security. The basket is located under the seat and not in front of it, with an enclosed case for privacy. The Cardinal Health Rollator has a foam back strap that will allow you to lean into your rollator when at rest, with the aluminum-based mobility aid supporting up to 300 pounds. It’s understated design, and muted colors hide ergonomic hand grips and a removable vinyl pouch. It may be more affordable than the other recommended aluminum rollators, but it does not sacrifice on its quality and features. When compared to other metals, the aluminum in this rollator offers superior strength, without the exuberant price tags typically associated with lightweight metals. Padded back support allows you to lean into your rollator with confidence when resting. It folds into itself easily for storage. Six-inch-high wheels will allow the rollator to glide over glasses or small obstacles. At just 16 pounds, the Cardinal Health rollator is a testament to the lightweight capabilities of aluminum. 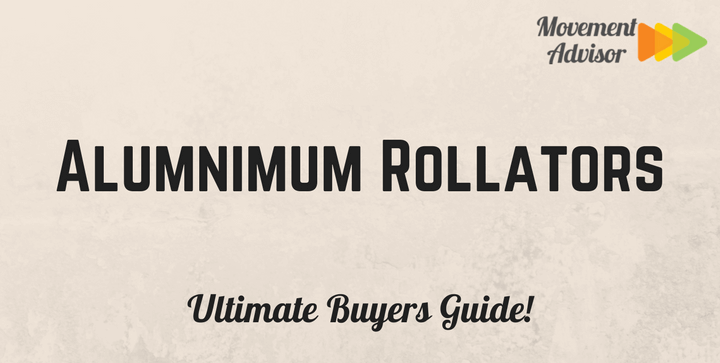 Once you try an aluminum rollator, you’ll probably won’t go back to other mobility aids. Aluminum is lightweight, allowing for easy maneuverability, which is a feature that elderly and those with degenerative issues will appreciate.